So many who work in the arts have asked me if the arts are good for learning and the brain. It is common knowledge that arts can arouse passions. The brain-based approach is to check out how it interfaces with the brain. Some believe that arts should be in school simply because many students thoroughly enjoy them. Others advocate a higher curriculum standing for arts on equal footing with math, science and language arts. There’s real science behind why arts should be in every kid’s school experience, every day. There is now substantial evidence that arts are a stand-alone discipline. I would argue that arts support the neurobiological development of the brain in ways that enhance the social and academic performance of our students. You’ll see that arts alter the neurobiological trajectory of the brain in ways that strengthen the academic and social skills unlike any other intervention. Arts change the brain like no other discipline. When schools reject arts, kids lose out. For students to do well in school, their brain must function in ways that are academically and socially useful. What do the arts bring to the table? The teachers are constantly trying new classroom strategies learned from books, trainings and conferences. The administrators are constantly inspiring, motivating and coaching their staff in endless ways to sharpen their collective saw. Unfortunately, this approach of trying to get better performance from students and staff can become overwhelming. There seems to be no limit to the quantity of available strategies, so it becomes very much of a hit or miss approach. This results in a dizzying and endless stream of programs, themes, missions, projects and, ultimately, burnout among many educators. But what if there was another way to go about this process. What if you could do less and get more? What is actually different in the brain that matters in the school context? 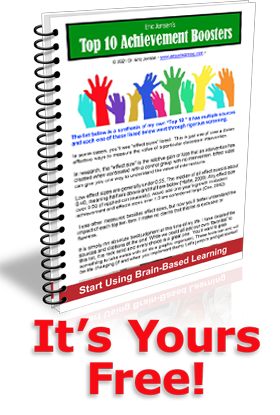 The brain-based approach is to find out what works in the brain that runs academic achievement. I suggest the existence of multiple operating systems in the human brain, each of which actually determine success in school. These operating systems (e.g. academic, social, athletic, survival) contribute towards your student success. But ultimately, since schools are all expected to reach performance goals, the academic operating system is of most relevance. Understanding this system is critical to a school’s success. Collectively, we could dream up a list of the mind/brain attributes and the specific skills that students need to have to make it in school. But the list might get a bit cumbersome and, ultimately overwhelming for staff. The operating system model attempts to simplify this understanding. We can do that for a good reason. Our brain does not need to be perfect for a student to succeed in school. Academic success does not require perfection and that’s good. School success requires good enough and that concept fits better with our brain. The aggregate of these factors is called our academic operating system. One does not need to be superior in all of these to get good grades. But one does need enough of each and any compensatory strategies to succeed. We all have a fault-tolerant brain, which is good at compensating and doing workarounds so that one can succeed at a task even if it has to find an unconventional approach to get it done. Avoid dismissing this as simply another way to label study skills. While I am a strong supporter of learn to learn skills, this operating system approach describes the deeper neuropsychological underpinnings of academic success patterns. After years of working with students teaching study skills, special education programs and mind/brain processes, what has emerged is a model featuring the fewest moving parts needed for school success. The attraction of this model is that it is simple enough for educators to understand, use and modify as needed. The brain-based approach is to connect the evidence from within the brain to results out in the real world. More importantly, it is based on a very powerful discovery in recent neuroscience: our brains have significant plasticity. One of the most astonishing developments in cognitive science of the last hundred years is the debunking of the fixed brain myth. We now know that brain changes daily. The concept of brain plasticity reminds us that students are not stuck the way they are. While their success is dependent on their operating systems, those systems can be upgraded. There are many things that effective schools do well. Whatever you’ve done in the past that worked for students, in some way, it has successfully changed the brain in ways that can be measured on achievement tests. Indirectly, we change the student’s brains at school. When we teach students how to play an instrument, it changes brain mass. Many arts can improve attentional and cognitive skills. Playing chess can increase reading and math, and the pathways that increase attention, motivation, processing and sequencing skills. A good arts program physically changes the brain. Good schooling has upgraded the student’s operating system. In fact, every successful school intervention features a variation on the theme of rebuild the operating system. This system works on the principle of fewest processes that matter most to the learning process. But if you simply try to cram more content into the same brain, without upgrading the operating system, students will get bored, frustrated, and fail. This is where the arts come in. Five universities were funded as part of the Dana Foundation efforts to discover the effects of art on the human brain. Preliminary data after five years shows that arts positively impacts cognition. Learning to play music is the best studied of the arts. New evidence suggests that music enhances cognition. There is evidence from top neuroscientists in peer-reviewed journals such as The Journal of Neuroscience. The title, Musical training shapes structural brain development – gives you a sense of the straightforward evidence. Here’s the significance of a quality academic operating system: it has the capacity to override the adverse risk factors of injuries, toxins, divorce, poverty or a substandard childhood! When this operating system is off or simply not up to the constraints and demands of school, students struggle. These are not simple study skills; these are the capacity to focus, capture and discriminate information, process it, remember and represent it in a meaningful way. This bundled set of skills can be more than a great equalizer; it can be a critical piece of your school strategy for academic success with low-income students. When you address academic problems, it will always come back to strengthening the student’s academic operating system. The brain-based approach says arts build stronger operating systems, which means better academic performance. In short, arts change the brain for the better and students are the big winners. If you want better academics, arts deliver. If you just want a better person for the real world, arts deliver. It’s time to get off the fence. It’s time to quit waffling and wondering if arts are worth it your school. They’re worth it. The real question is, Are you going to stand up for is good for kids, or fall short by drinking the kool-aid of the scared educators who think kids just need more drill and kill? I’m interested in seeing your comments. Details of supporting evidence for statements made, with live links, would have been appreciated. I am an art educator in a public school. For nearly 20 years I have witnessed the mental gymnastics the arts put my students through. The arts touch physical, mental and emotional health like nothing else. It seems so difficult to get the powers that be to recognize just how essential they are. Finally science is starting to back up what artists have known for years.